The main issue of the position is the life of White's group at the top. The group has one eye and a possible second one in ko. I postpone discussion of the issue of ko till the possibility appears for the first time. I think now that it was better to start fighting ko using breaking out as ko threats. As there are a lot of those the outcome would be a comparatively easy escape, while Black would take quite a large profit. White 1 captures the stone. It seems that White has no other option here. Black 2 is a standard way to make the eye false. a would be another possibility. White has to capture with 3. Black 4 was too mild, leaving some space for White to make a second eye. The purpose was to confine White at the top. 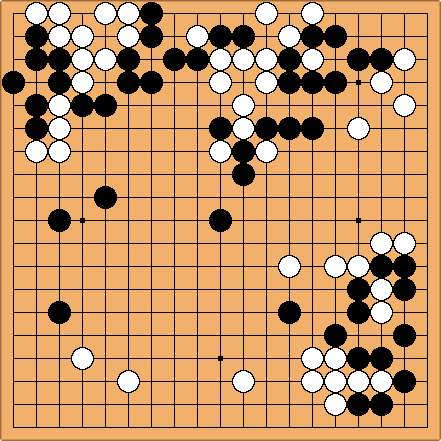 White 5 jumps out threatening to connect to the stone on the left and Black 6 separates the groups. White 7 tries to break out aiming at someting like a space for a second eye. Black counters with 8. White plays atari with 9 and Black has to connect with 10 in order to keep White's eye false.